Anyway comfort food doesn’t have to be the same old same old. Risotto makes some awesome snow food. However, if you don’t have the time to devote to making risotto, don’t because the enemy of a risotto his time and adding the ingredients wrong. Risotto is a dish that requires babysitting from start to finish. Here is my go to recipe. I will alter the ingredients depending on what I have in the kitchen on hand at the time. Usually a risotto is what I do with leftovers. If I don’t have chicken or sausage I might use ham or shrimp or something else. Sometimes I do it with just mushrooms and pick a bunch of mushroom varieties, not just one. 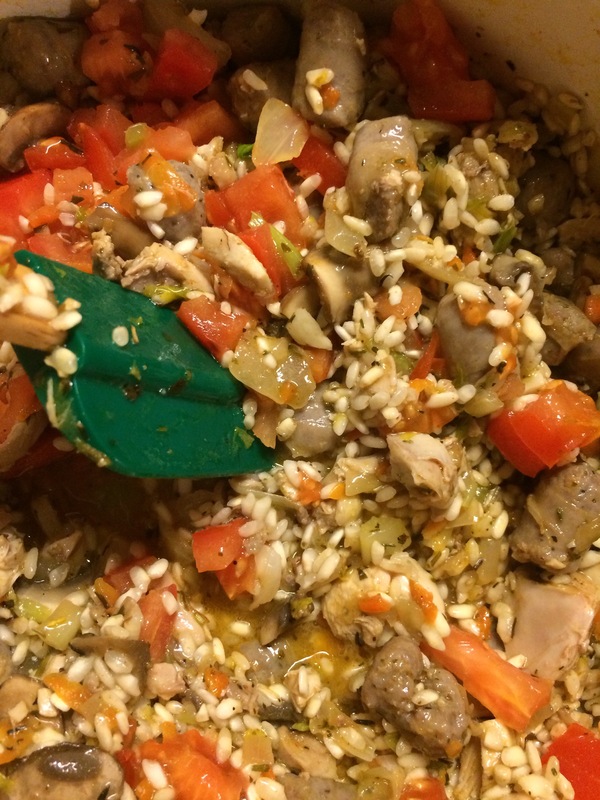 In other words …..lots and lots of mushrooms (yum). If I do it an all mushroom risotto I also add roasted sweet peppers and a small log of goat cheese about 4 – 5 ounces or a similar size container of crème fraîche in addition to the Parmesan. 1/2 a roast chicken shredded- no skin from chicken! Put the stock in a pot over low heat. Or if you’re pressed for time you can warm a couple cups of the time by microwaving in a microwave proof measuring cup. Meanwhile, put the 1/4 of the olive oil in a large Dutch oven over medium heat. You may have to add a little more than a quarter cup just depends on your pot. When it’s warming up but not hot, add the garlic and onion and cook, stirring occasionally, until they begin to soften. This might take 5 to 7 minutes. Add the mushrooms, celery, carrots and season with salt and pepper. Add herbs. Cook, stirring occasionally, maybe an additional 8 to 10 minutes. Add the sausage, and when of the sausage starts to cook and turn color, add your shredded chicken. I originally started making this recipe to use up leftover chicken. Adding small bites of sweet sausage only makes it better! Add the rice and stir until it looks sort of translucent and begins to stick together, about 5 minutes. Add the wine and cook, stirring once or twice, until it’s mostly absorbed by the rice. Start adding the broth about 1/2 to 3/4 cup at a time, waiting until each stage of broth is pretty well absorbed into the rice before adding the next bunch of broth. Stir frequently and keep an eye on the heat so the liquid simmers gently NOT boils into oblivion. When I start adding the broth, I cover the pot a couple minutes at a time in between stirring. After you add 5 cups of broth you were ready for the next step which is when the rice is tender, (after about 30 minutes of adding 5 of the 6 cups of stock), add the frozen peas along with last 1 cup of stock and cook, stirring frequently, until tender, 5 to 7 minutes. Turn the heat to low and stir in Parmesan cheese. Turn off the heat and stir in an additional 2 tablespoons olive oil and the orange zest and juice. Taste and adjust the seasoning, and serve hot, garnished with parsley. The feeds 4 to 6 and trust me there won’t be much in the way of leftovers. Even teenagers will eat it! Any leftovers you have should be stored in the refrigerator in a covered container. It’s only good for a few days after cooking so don’t let it hang around more than that. 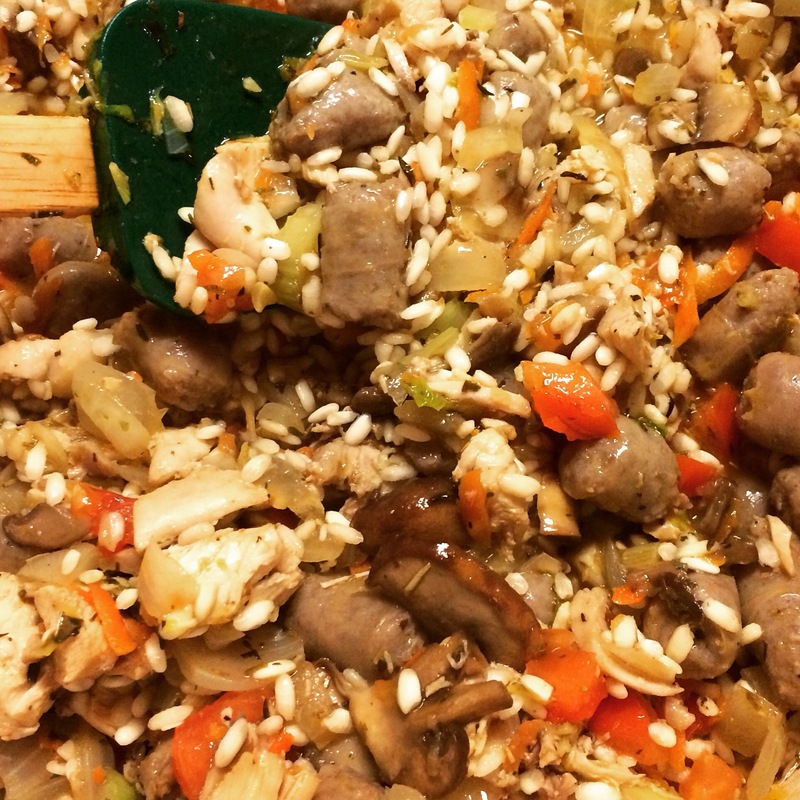 This entry was posted in food, home front, recipes and tagged comfort food, food, risotto, winter by carla. Bookmark the permalink.